Jersey Coastguard contacted us through our relationship with Central Training Group to design, supply and fit a bespoke high visibility vehicle graphics kit. A new Toyota Hilux was being added to their fleet and needed to be bought up to spec. The coastguard is responsible for the provision of coastguard services throughout Jersey and operates port services vehicles and emergency response vehicles. They wanted a design that would significantly increase the visibility of the vehicle when responding to an emergency and that was clearly identifiable as a coastguard vehicle. 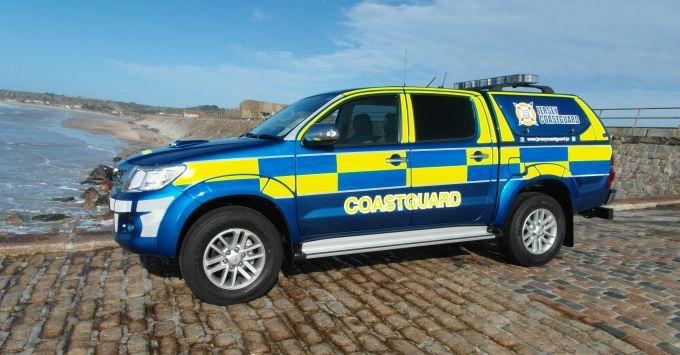 The challenge was that, as this was a brand new Toyota Hilux that wasn’t available at the time in the UK – and was awaiting delivery to Jersey Coastguard when the initial enquiry was made – we didn’t have the design on our system. This meant that there was a very tight lead time from when the vehicle arrived in Jersey to when it had to be completed. One of PVL’s account managers went with Central Training Group to Jersey to see the vehicle when it arrived. We met with Russell Mathew and James Letto from Jersey Coastguard so that we could run through the specifics of the design whilst checking that we had all of the information we needed to supply the kit. Following a very useful site visit the kit design was finalised, produced and packed ready for delivery. Just three days after the initial visit our Project and Fitting Manager flew with Central Training Group to Jersey to fit the kit. Some of the reflective panels that were needed on the vehicle had to be cut to fit on site. This didn’t delay the process and the fitting was completed that same day. Throughout the process Jersey Coastguard was kept updated on how the design and production of the kit progressed. We were able to ensure that the kit was fitted without any issues whilst the vehicle was simultaneously being fitted with an upgraded beacon and siren package. In all the process took less than a week to design, produce and fit a bespoke kit and the vehicle, even if we say so ourselves, looks fantastic.